Crystal Exchange America is delighted to post additional Swarovski Retirements to their online resource RetiredSwarovski.com. RetiredSwarovski.com is a web site that is maintained by Crystal Exchange America, along with several other companies that offer Swarovski-related services. Most recently, the site was expanded to include more Swarovski product lines in addition to the Silver Crystal line. The site now includes Swarovski Lovlots, Swarovski Disney Collection, Swarovski Crystal Moments, Swarovski Paradise, Swarovski Soulmates, and Swarovski Home and Interior. This fantastic new content that is certain to be of interest to many Swarovski crystal collectors. The Swarovski Crystal Moments product line has separate pages for each year of retirement from 1991 to 2009. The Swarovski Home and Interior product line has separate pages for each year of retirement from 1995 to 2009. The Swarovski Paradise product line has separate pages for each year of retirement from 2002 to 2009. Due to the small number of retirements, the Swarovski Disney collection product line has a single page showing all retirements from 2008 to 2010. The year of introduction and year of retirement are listed with each item on the page. As the Swarovski Lovlots product line also has a small number of retirements, they too are on a single page showing all retirements from 2006 to 2010. The year of introduction and year of retirement are listed with each item on the page. Lastly, Swarovski Soulmates are on a single page showing all retirements from 2009 to 2010 with the year of introduction and year of retirement are listed with each item on a single page. RetiredSwarovski.com has a wealth of information about discontinued Swarovski figurines, and pending Swarovski retirements. The site navigation allows crystal collectors to find Swarovski Silver Crystal retirements alphabetically in their Swarovski Library, or browse by year in the Swarovski Retirements. Additionally, there are also pages for the various Swarovski product lines that feature a crystal listing for items that are “retiring soon”. The “retiring soon” pages are frequently updated as the company Swarovski announces which figurines that will soon be discontinued. RetiredSwarovski.com also has a page on the site for hints on cleaning Swarovski. Here, crystal collectors can get suggestions for task considerations, a supply list, a thorough cleaning overview, and explore recovery possibilities if crystal might become damaged at some point during the cleaning process. As the site sponsors have personal interest in Swarovski, http://www.RetiredSwarovski.com contains information about the sponsors’ products and services. For Swarovski crystal owners looking to buy or sell Swarovski, collectors can learn more about Crystal Exchange America. 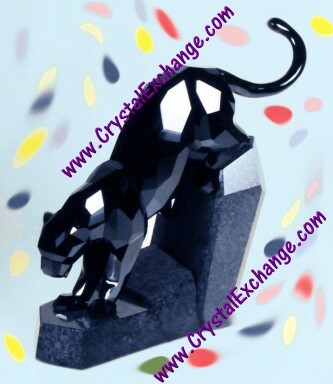 Crystal Exchange America has over 13 years of experience and assists collectors adding crystal to their Swarovski collection as well as helping those who want to liquidate Swarovski crystal collections or sell only a part of them. Crystal Exchange America, a retired Swarovski dealer, specializes in discontinued and retired Swarovski crystal. Swarovski collectors can also learn more about the Swarovski catalogs offered by Warner’s Blue Ribbon Books on Swarovski. The Swarovski catalogues can be purchased with color photos, or black and white photos. If a collector is trying to establish the Swarovski value of a collection for insurance purposes, these Swarovski books are a must. Warner’s Blue Ribbon Books has an extremely reliable record of annually publishing their books for the past 17 years. The books can be found and purchased at http://www.wbrb.com . Warner’s Blue Ribbon Books also has an outstanding Swarovski Database available online. The database can be used by purchasing an online subscription to the service allowing customers access to information on over 2300 Swarovski crystal collectibles. Swarovski crystal information available includes: name, part number, system number, image, size, designer, MSR, ERV (Estimated Replacement Value), and more. The subscription service is green and economical method of learning more about the Swarovski crystal figurines in a customer’s collection. Sadly enough, at some point, most Swarovski collectors will need information on Swarovski restoration or repair. While Swarovski does repair items that are presently available in their boutiques, they do not repair crystal figurines that are discontinued. RetiredSwarovski.com contains information about repair and restoration, and a company that specializes in restoring retired Swarovski…..The Crystal Wizard. These Swarovski restoration experts can be found at http://www.tcwizard.com . For the avid crystal collector looking for more than the Swarovski figurines, Crystal Exchange America also sells the most popular books on Swarovski Crystal. Two of the collectors’ favorite Swarovski price guides are written and published by Swarovski collectors: Warner’s Blue Ribbon Books on Swarovski. The company Swarovski is 'not' affiliated with the RetiredSwarovski.com, nor does it produce content for the site.